I’m an inter-disciplinarian artist down with the historical avant-garde. I’m also Jewish, and was curious about what a famous German artist wanted to communicate about World War II. The lights were effective, with a soft ambiance and nice shifts. 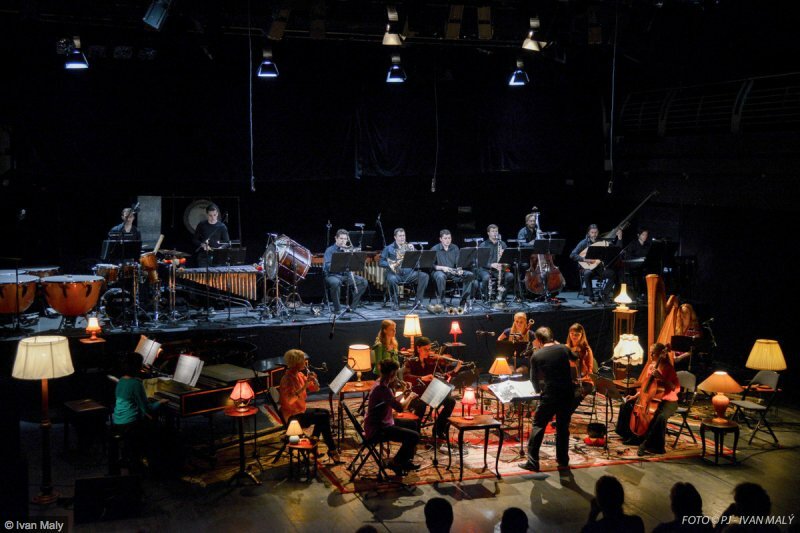 The orchestra members were individually seated next to vintage lamps. There was a nice mix of blues and indigos that filled the stage midway through the performance, and the finale of the piece was striking with a single hanging bulb lighting a trumpet solo. This moment seemed a good meld of content and meaning. The lighting was great. The set was basic and consisted of two platforms; a raised staged where the brass and keyboard musicians played, and a half circle orchestra below. Drums flanked each stage on opposite sides, and the conductor was central. To my knowledge, just basic, conventional concert formation. It was pretty fantastic to see a female musician wielding a powerful drum and xylophone set-up, which was a great image in itself. The conductor was also female-identifying, and it was nice to see her at the helm of this power structure. This was more of a concert than a theatre event, and nowhere near a conventional play, so costuming was simple, and worked to not distract from the music itself. The male-identifying musicians wore all black and the female performers wore solid neutral colors, which may have reflected the gender-based theme the performance was trying to explore. The performance was a musical composition collage layered with American Jewish modernist writer Gertrude Stein’s World War II memoir, which she wrote in occupied France while living with her partner, Alice B. Toklas. The memoir itself is problematic, as noted in the program, because of Stein’s emphatic support of the anti semitic Nazi collaborationist Philippe Petain. The performed excerpts I heard highlighted her apathetic view on the war, (described in the program as “neutral and meditative”). Deliberately executed in dispassionate, blasé fashion by the musicians, it felt like the performance was asking the audience to channel Stein’s neutral voice as “Art Critic” in our own observations on war. The music was a pastiche of baroque works, modernist harmonies, director/composer Goebbels’ own work, and ambient sound sculpture. There were a few moving moments, like Stein’s strange but astute definition of war which as time, where “the years and months are long, but the weeks go quickly.” Similarly, other moments struck close to home. I couldn’t help drawing parallels between her description of “disappearing bodies” and what is happening with ICE. In a performance without characters, the musicians became stand-in symbols of lost populations, whose solos echoed in the space hauntingly, particularly in the last moment of the trumpet finale. The musicians from the Philadelphia Orchestra and Tempesta Di Mare were strong and skilled. There seemed to be some effort in empowering women, from the marketing to the orchestra musicians and conductor. Goebbels also chose to highlight Stein’s description of “the 19th century as a white man’s world”, so clearly there was an direct effort. And yet I never felt this this production transcended that world in any clear, definitive way, outside of quoting Stein and staging gender division. The “gendered experience of war” (as found in a lot of the supportive materials) was never really unpacked. Also, the full-house audience I saw was only made up of older, white people. Personally, I had a volatile, triggering experience. I found the work indulgent, where Stein served as puppet figure/token-Lesbian Jew, further complicated by her sympathy for Petain. Her writing was never deconstructed – it became the authoritative voice on war because it was never challenged. To me, this piece functioned as an experiment in old school avant-garde collage, and Stein’s perfunctory voice underscored a performance about war while avoiding any direct reference to its devastations or the forces that perpetuate it. Why does the piece feel like war needs a neutral exploration? What can we contemplate neutrally anymore? After all we know – dramaturgically, personally, philosophically – and especially now – why should we try to be neutral?